Home > 2011 > 11 > 01 > Help us spread the word on openSUSE 12.1! Help us spread the word on openSUSE 12.1! In less than 3 weeks, our little baby, openSUSE 12.1, will be released into the wild. Now as you know, babies need lots of attention! This is where we need YOU. openSUSE 12.1 needs to be promoted everywhere! That is, on your blog; on twitter, facebook, Google plus; and much more! Read on for details and tips on how you can help us spread the word! We’ve got a few nice backgrounds for you to be used on your (micro)blog or your desktop! 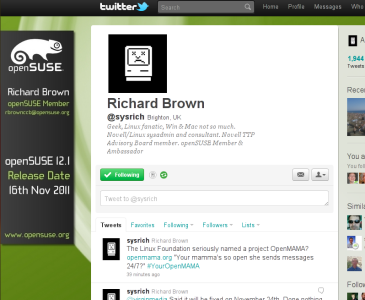 Richard “Ilmehtar” Brown has created a very cool openSUSE 12.1 Twitter background. You can add it to your blog in two ways. First, you can add one of the generic Twitter backgrounds. Pick one from here. A cool, customized Twitter background! To get your own, custom background like Richard has, download the svg file here and customize it with Inkscape. Find a how-to on the wiki. Find many other cool openSUSE twitter backgrounds here! “medium” is the size of the counter; it can also be “small” or “large” and we also have “wide” for a banner. See the Countdown page on the openSUSE Wiki for more countdown information, code and tips! For more tips and customization check out the Twitter Widget section on the wiki. I’m sure you know what to do with these buttons! Like openSUSE, +1 us, join us! Also join the openSUSE Group on facebook which you can visit here. And join the identi.ca group! Of course, you can and should attend or organize an openSUSE 12.1 Launch Party! We’re working on an article about this, stay tuned… We’ve got some nice goodies planned for those who organize a party! If you want to know the latest stuff about openSUSE promotion sign up to the ambassador mailinglist. Helping out is also greatly appreciated. For openSUSE 12.1 we have the Launch Checklist which has a list of tasks… If there is stuff you want to/can help with, let us know on the openSUSE marketing mailing list! There’s lots of writing to be done, like articles about the great new GNOME 3.2, the polish done on XFCE and LXDE, and what’s better about KDE’s latest desktop and netbook offerings. But we can also use some more technical writing help. We’ll review and edit the articles for English language, what we need is the content… Many of your marketing friends are not so technical! … you should have a lot of fun! Next step, translate to portugues and spread on every corner of this amazing country called BRAZIL. Last time I checked OpenSuse was fully translated to Portuguese of Brasil. What I would like to see was Opensuse in PT-PT, European Portuguese. I installed 11.4 and selected Portuguese and to my dismay and disappointment everything was in PT-BR, not in PT-PT. And I can’t use a OS like that. Sorry, but I can’t. I can understand PT-BR perfectly,but you can’t make me like it. Well, that is quite a disservice OpenSuse is making to Portuguese users, because every other major distro I know has better language support for the European variant of Portuguese. get rid of that stuff…. Finally, he add “00:1f.2 IDE interface: Intel Corporation 6 Series/C200 Series Chipset Family 4 port SATA IDE Controller (rev 05)” for Huron River platform. Hop this work at this version. i want to suggest making some short videos about openSUSE so that fans can upload them on various video sharing websites and this cause to more spreading of openSUSE in the world. also i put some links and banners of openSUSE in my weblog.